Diabetic retinopathy (DR) is the fastest growing cause of blindness, with nearly 415 million diabetic patients at risk worldwide. If caught early, the disease can be treated; if not, it can lead to irreversible blindness. Unfortunately, medical specialists capable of detecting the disease are not available in many parts of the world where diabetes is prevalent. We believe that Machine Learning can help doctors identify patients in need, particularly among underserved populations. A few years ago, several of us began wondering if there was a way Google technologies could improve the DR screening process, specifically by taking advantage of recent advances in Machine Learning and Computer Vision. In "Development and Validation of a Deep Learning Algorithm for Detection of Diabetic Retinopathy in Retinal Fundus Photographs", published today in JAMA, we present a deep learning algorithm capable of interpreting signs of DR in retinal photographs, potentially helping doctors screen more patients in settings with limited resources. One of the most common ways to detect diabetic eye disease is to have a specialist examine pictures of the back of the eye (Figure 1) and rate them for disease presence and severity. Severity is determined by the type of lesions present (e.g. microaneurysms, hemorrhages, hard exudates, etc), which are indicative of bleeding and fluid leakage in the eye. Interpreting these photographs requires specialized training, and in many regions of the world there aren’t enough qualified graders to screen everyone who is at risk. Figure 1. Examples of retinal fundus photographs that are taken to screen for DR. The image on the left is of a healthy retina (A), whereas the image on the right is a retina with referable diabetic retinopathy (B) due a number of hemorrhages (red spots) present. Working closely with doctors both in India and the US, we created a development dataset of 128,000 images which were each evaluated by 3-7 ophthalmologists from a panel of 54 ophthalmologists. This dataset was used to train a deep neural network to detect referable diabetic retinopathy. We then tested the algorithm’s performance on two separate clinical validation sets totalling ~12,000 images, with the majority decision of a panel 7 or 8 U.S. board-certified ophthalmologists serving as the reference standard. The ophthalmologists selected for the validation sets were the ones that showed high consistency from the original group of 54 doctors. Performance of both the algorithm and the ophthalmologists on a 9,963-image validation set are shown in Figure 2. Figure 2. Performance of the algorithm (black curve) and eight ophthalmologists (colored dots) for the presence of referable diabetic retinopathy (moderate or worse diabetic retinopathy or referable diabetic macular edema) on a validation set consisting of 9963 images. The black diamonds on the graph correspond to the sensitivity and specificity of the algorithm at the high sensitivity and high specificity operating points. The results show that our algorithm’s performance is on-par with that of ophthalmologists. 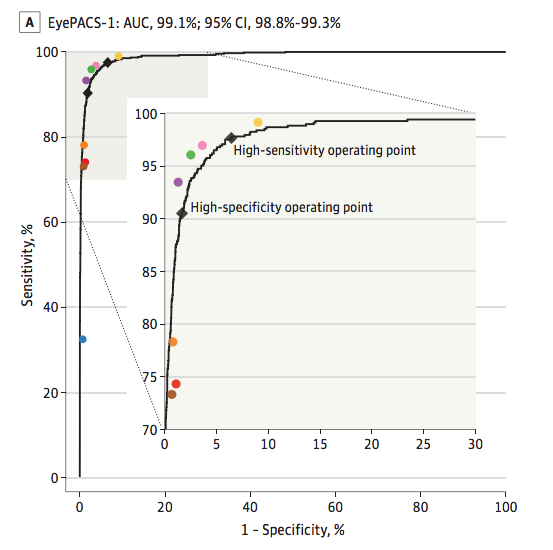 For example, on the validation set described in Figure 2, the algorithm has a F-score (combined sensitivity and specificity metric, with max=1) of 0.95, which is slightly better than the median F-score of the 8 ophthalmologists we consulted (measured at 0.91). These are exciting results, but there is still a lot of work to do. First, while the conventional quality measures we used to assess our algorithm are encouraging, we are working with retinal specialists to define even more robust reference standards that can be used to quantify performance. Furthermore, interpretation of a 2D fundus photograph, which we demonstrate in this paper, is only one part in a multi-step process that leads to a diagnosis for diabetic eye disease. In some cases, doctors use a 3D imaging technology, Optical Coherence Tomography (OCT), to examine various layers of a retina in detail. Applying machine learning to this 3D imaging modality is already underway, led by our colleagues at DeepMind. In the future, these two complementary methods might be used together to assist doctors in the diagnosis of a wide spectrum of eye diseases. Automated DR screening methods with high accuracy have the strong potential to assist doctors in evaluating more patients and quickly routing those who need help to a specialist. We are working with doctors and researchers to study the entire process of screening in settings around the world, in the hopes that we can integrate our methods into clinical workflow in a manner that is maximally beneficial. Finally, we are working with the FDA and other regulatory agencies to further evaluate these technologies in clinical studies. Given the many recent advances in deep learning, we hope our study will be just one of many compelling examples to come demonstrating the ability of machine learning to help solve important problems in medical imaging in healthcare more broadly. Learn more about the Health Research efforts of the Brain team at Google and about the Google Accelerated Science team.